In 2018, there are 18 Georgia House districts in which progressive candidates are competitive. Let's take a look at those districts, their demographics and the candidates. click on each flippable or Protect district For more Detailed information. 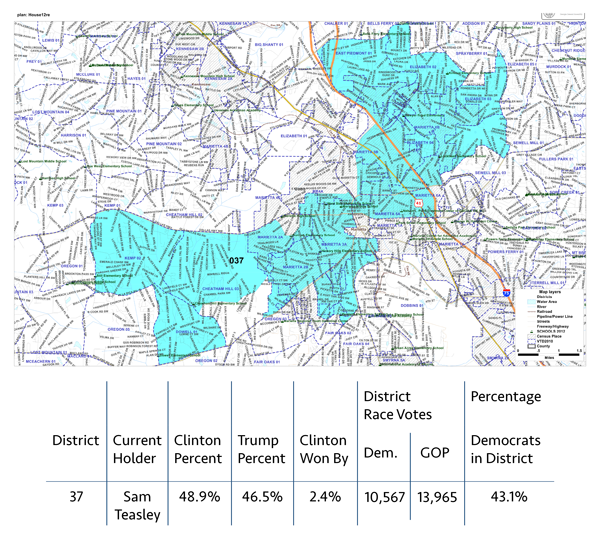 In District 37, Donald Trump lost by 2.4 percent, while Rep. Sam Teasley won by 13.8 percent. This district is starting to trend purple. In 2016, Hillary Clinton won this district by 4.3 percent. Alas, Rep. Deborah Silcox ran unopposed. Here's a look at the district. In District 80, Donald Trump lost by 13.8 percent, while Rep. Meagan Hanson won by 1.16 percent. This district is trending purple based on the 2016 election. In District 111, Donald Trump lost by 2.6 percent, while Rep. Brian Strickland won by 3.3 percent, he vacated the seat to run for the Georgia Senate. This district is trending purple. In District 40, Donald Trump lost by 14 percent, while Rep. Rich Golick won by 7 percent. Golick has announced he will not seek re-election. In District 54, Donald Trump lost by 13.8 percent, while Rep. Beth Beskin won by 21.1 percent. This district is worth a second look based on the 2016 special election. Hillary Clinton won this state district by 4.3 percent. Rep. Scott Hilton was uncontested. Hillary Clinton won by 11.6 percent. Unfortunately, Rep. David Casas ran unopposed in the state race. Take a look at the district. It is trending purple. Hillary Clinton won this state district by 5.2 percent, but Republican Rep. Wendell Willard ran unopposed. In District 79, Hillary Clinton won by 8.1 percent after Gary Johnson pulled about 4.7 percent. Rep. Tom Taylor ran unopposed. In District 105, Donald Trump lost by 7.3 percent, while Rep. Joyce Chandler won by 0.9 percent. This district is trending purple based on the 2016 election. In District 108, Hillary Clinton won by less than 1 percent, which shows this district is trending purple. In fact, Rep. Clay Cox won by only 1,180 votes or less than 1 percent. Hillary Clinton won this district by 5 percent. Rep. Gerald Greene won his race against an independent candidate by 4,949 votes. This district is flippable. In 2016 Hillary Clinton won or fared well with at least 45 percent of the vote in these five districts that have conservative incumbents. The changing demographics of these districts suggests they bear monitoring. Hillary Clinton lost District 43 by a mere 2.1 percent. 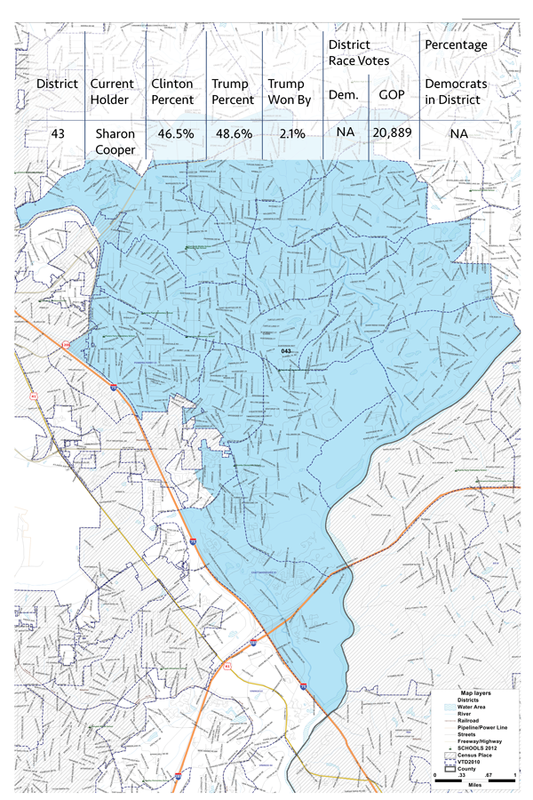 Rep. Sharon Cooper ran an uncontested race. Donald Trump eked out a 3.8 percent win in this district while Rep. Buzz Brockway only won by 2,557 votes. In the last election, Rep. Bett Price won her seat in an uncontested race. This is usually a solidly red district, as well as a highly educated one, but Donald Trump won the district by only 3 percent. Donald Trump barely won this state district by 1.3 percent. Rep. Brad Raffensperger ran unopposed. Donald Trump won this state district by 5 percent. Rep. Heath N. Clark was uncontested in the state race. Progressive Rep. Sam Park won the seat by less than 500 votes. This district is changing and Park's willingness to knock on any and all doors made a difference in the race. This seat needs to be protected and kept in the progressive column. Progressive Rep. Jonathan Wallace won the seat by 1,061 votes in the November 2017 special election. 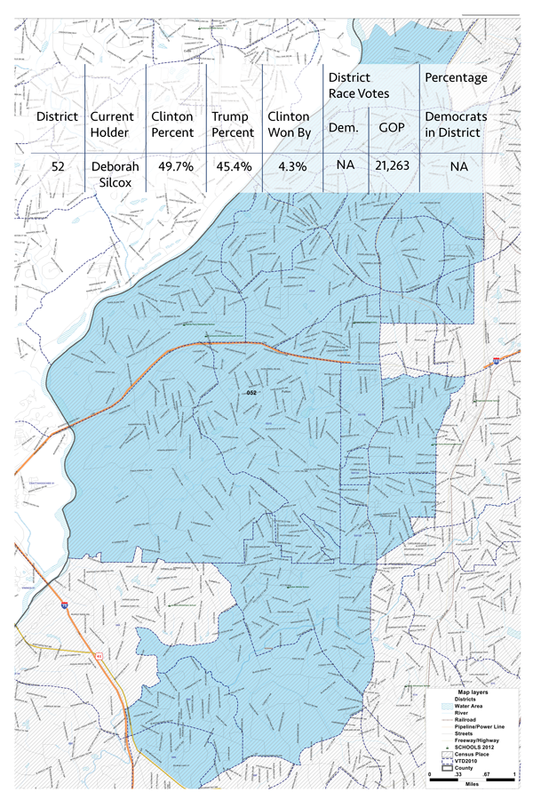 This highly educated district includes part of Athens, where campus carry remains very unpopular. This seat needs to be kept in the progressive column. What an election in 2017! Rep. Deborah Gonzalez, the progressive, ran an outstanding race in the special election and won with 53.5 percent of the vote. Now, progressives need to work to protect the seat that includes part of Athens. Progressive Rep. Bill McGowan won the seat by less than 300 votes in the November 2016 election. He managed to defeat the incumbent who won the seat as a Democrat, then, in 2010, changed parties. Given the purple state of this district, let's keep this one in the progressive column. Hillary Clinton won this state district by 2.7 percent. Rep. Brett Harrell ran uncontested. The district is trending purple. Conservative Rep. Ricky A. Williams won the district by less than 3,000 votes. Rep. Williams voted for campus carry. Note: Milledgeville is home to three colleges. The district's demographics are changing, which suggests it could be flippable.